An end to men’s violence against women. Women to be able to walk the streets safely by night and day. More governmental funding for refuges and for women and children fleeing domestic violence. Men are invited to support the elimination of violence against women and our walk by lining the streets and cheering us on. WILPF Cornwall will be hosting a public screening of a series of five films under the heading ‘Women War and Peace’ as part of our campaigning on Gender and Militarism. The films represent the work of three women film makers to address the omission of women’s stories from wartime reporting. The films illuminate the complex, nuanced and global experiences of women in conflict settings and were first screened on American television in the Autumn of 2011. The films feature the stories of courageous women who are changing the rules of engagement and working for peace and justice in Afghanistan, Liberia, Colombia and Bosnia. By placing women at the centre of a discourse about global security, the series offers a critically important perspective on war today. Each film runs for approximately 45 minutes and there will be a general audience discussion after its screening. Doors open 7pm for 7.30pm screening. Cafe will be open for hot and cold drinks and vegan/ vegetarian refreshments. Women War and Peace invites you to see war through women’s eyes. Their hard earned wisdom will change the way you look at war forever. WILPF Cornwall invites the public to celebrate WILPF’ s Centenary at an exhibition that tells the story of the events leading up to the Women’s Congress in The Hague in 1915. Information and pictures relating to WILPF’ s current work will also be on display. A special opening event will take place at the Marazion venue Monday 5th October, 7pm – 9.30pm where we will show the film ‘These Dangerous Women’ about the attempt of women to reach the Hague in 1915. Sahar Mediha Al-Naas (University of Exeter) will then give a talk, followed by a discussion, on the plight of Libyan Women. Songs for Peace, led by Pip Wright and Singers will be sung. This is a free event. Donations are welcome and refreshments will be available. Free Parking at end of King’s Road by kind permission of St Aubyn Estates, mention you are parking there for an event at the Quaker Meeting House. Marking UN International Day of Peace and UN International Day for the Total Elimination of Nuclear Weapons. 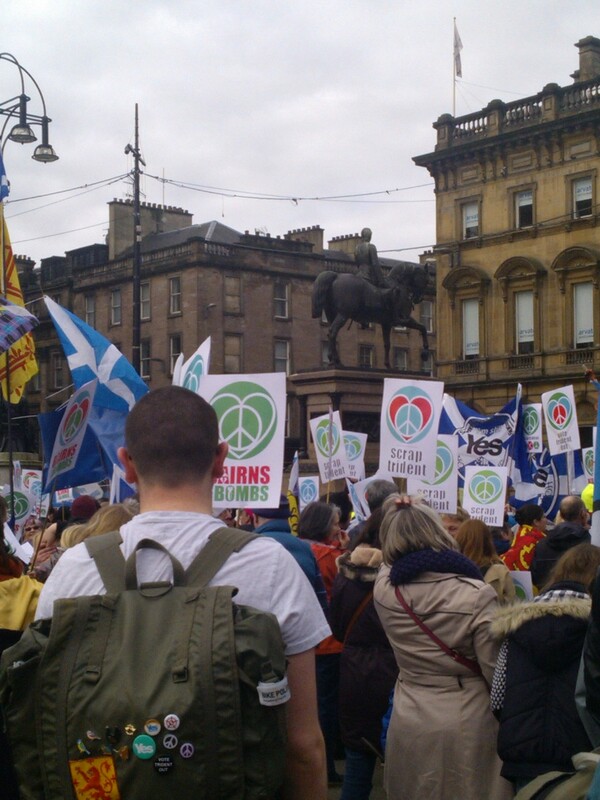 The event is organised by the Scottish Branch of WILPF with support from SCND and other members of the Scrap Trident Coalition. 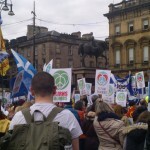 Today, the Scrap Trident coalition, of which Scottish WILPF is a member, is working towards the blockade of Faslane on the Global Day of Action Against Military Spending. Do join us as we need lots of people to sit in the gateways and lots more people there to support them. Details of how to get involved are here. 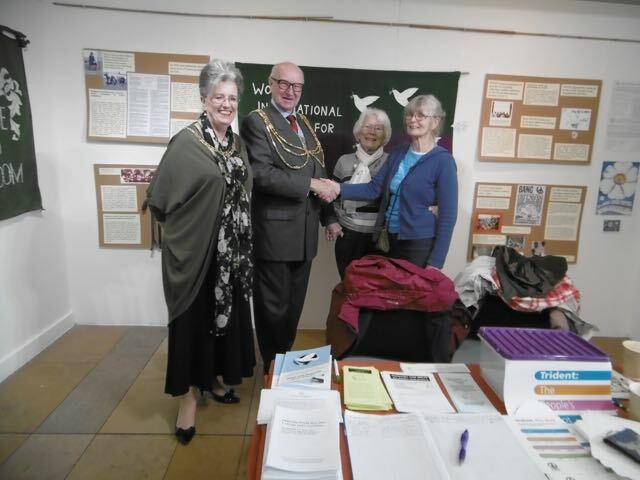 WILPF Brighton Branch has started off our centenary year with an excellent and attractively laid out exhibition at the Jubilee Library in Brighton. It tells the story in words and pictures of the events leading up to the Congress at The Hague in 1915 and includes information and pictures relating to WILPF’s current work. The text was supplied by WILPF historian Katrina Gass. The exhibition was opened by the Mayor on 2nd March and the Mayoress, who was also present, joined WILPF on the spot!! 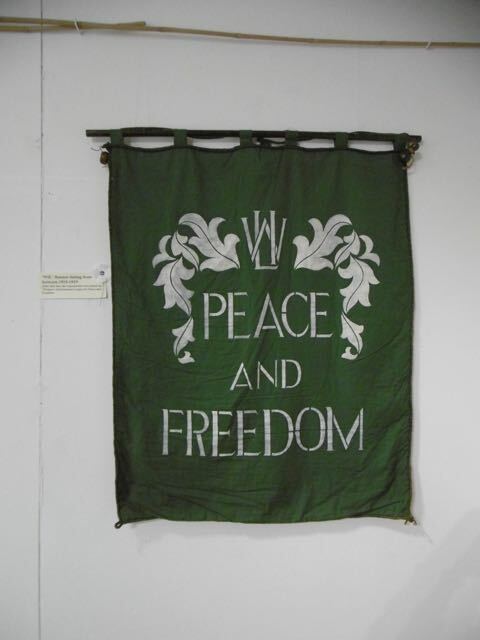 Some splendid banners are hanging on the walls including a recently rediscovered one from the very early days, when WILPF was called “WIL”, and a lovely brand new one created by Jenny Engledow especially for the centenary. Brighton Branch has also published a very interesting booklet of the recollections of its members. Rising stars from the National Youth Jazz Orchestra are celebrating International Women’s Day and raising funds for WILPF at the H G Wells Centre, Bromley, Kent, from 2.30 to 5.30pm. Brighton Museum and Art Gallery holds the exhibition ‘War Stories: Voices from the First World War’. The exhibition includes a piece on WILPF member Eileen Daffern, now deceased. This contribution to the exhibition led to the current Branch Secretary being traced by the exhibition creators for an filmed interview about WILPF. ‘Remaking Picasso’s Guernica’ at the Pallant House Gallery, Chichester. Members of WILPF Brighton and Hove District Branch worked on the banner other activists and academics. The banner forms part of the ‘Conscience and Conflict, British Artists and the Spanish Civil War’ exhibition, which is excellent with many moving and wonderful paintings and drawings by people such as Picasso, Henry Moore, John Armstrong and others. 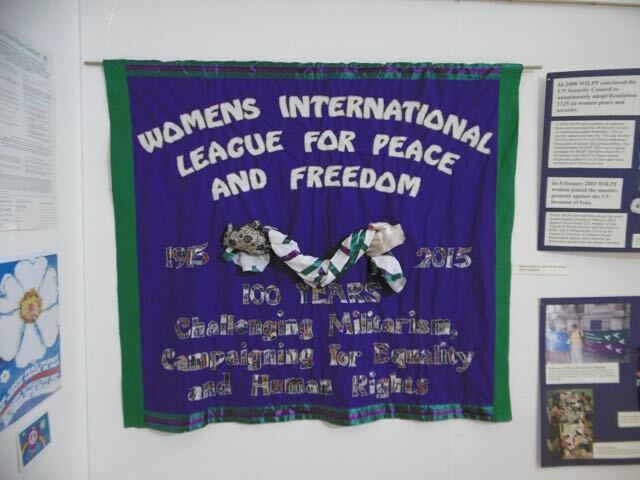 Brighton and Hove District Branch will be holding a WILPF centenary exhibition in the Jubilee Library, Brighton. The following is a message from Penny Stone about a singathon she is organising to mark International Women’s Day on 8 March 2015. I am organising a singathon for International Women’s Day 2015. The event will commemorate the centenary of the founding of the Women’s International League for Peace and Freedom, the oldest international women’s peace organisation in the world. The story of the founding of WILPF is quite amazing, and you will hear about it if you come to the singathon! 🙂 we will sing 100 songs in honour of this centenary celebration. This email is asking you to save he date, Sunday 8 March from 3pm to midnight (or some of that time!) to come and sing a song or two with us. Penny Stone will lead most of the singing, most of which will be singalong songs, or at least singalong choruses. The themes for the song choices will be women, international, peace and freedom – a pretty broad lot of songs! I would also like to extend the invitation to anyone who wants to come and sing a song or lead a song to do that. I will need to know by February 18th if you would like to do this, and what songs you will be singing as I need to make sure no one is doubling songs. I will also be projecting the lyrics for many songs to be sung along to, so will need time to prepare this. There will be a strict 5 minutes per song allowed, including any talking before hand to tell the story or teaching of parts to enable us to finish by midnight. Song suggestions are very welcome also, even if you don’t want to lead the song and I’ll need these by February 18 as well. The singathon will be free to attend and donations will be collected and split between two funds: A fund to enable women from poorer Countries to travel to The Hague for the women stop war conference in April and Penny’s ongoing activism fund, which this year is supporting her to travel to the Wilpf conference at The Hague to get everyone singing and to work with children in Palestine with music as a form of resistance. I look forward to hearing from you (if you’d like to share a song or two). I hope to have the same hall at St. John’s on Princes Street but am waiting for confirmation, so more info and a flyer to share will be circulated in due course. For now, save the date if you can! 🙂 oh, and please do pass onto anyone else who might be interested.